This web site is for people requiring a Genie scissor lift and will help you get the best scissor lift . Powered Access Services are the UK's formost supplier of scissor lift hire equipment in the UK. The modern fleet of the very best powered access platforms in the UK sourced from the worlds leading manufactures including Skyjack and Upright enables you to tackle almost any task at height. National coverage from our three branches in Scotland, Midlands and London enable fast deliveries to be made. Safety training courses for scissor lift and boom platforms for operator safety are run by our in house training instructors. One fall arrest link at rear. A lightweight full body harness. Adjustable at leg loops, shoulders and chest. Suitable for Work Restraint and Fall Arrest. The Genie SuperLift Advantage is a package of options you select to design the Superlift you need and want... and you get more value for your money. Choose the base and the mast--either Standard Base with five different lifting heights--or Straddle Base with three different lifting heights. Choose the load handling attachments you need. Up to 4.2 m (13' 9"). Material handling brought within the reach of all pockets enabling the operator to lift and transport from 91 kg to 454 kg (200 lbs to 1000 lbs) and from heights of 1.72 m to 7.9 m (5' 8" to 26'). Up to 6.94 m (22' 9"). For heavy-duty material handling up to 7.9 m (26'). A complete range of lightweight aluminum scaffolding systems. The Genie load Lifter lifts up to 200 lb (91 kg) to a height of 5' 7" (1.7 m). It is ideal for applications such as picking up and moving items such as parcels, computer and electronic equipment, small appliances, paper and printed material. The Genie Super Hoist is a portable telescoping pneumatic hoist which uses CO2 or compressed air to lift up to 300 lb (136 kg) to a maximum height of 18' 4 1/2" (5.6 m). the Super Hoist is supplied ready to hook up to a C)2 gas bottle, but can easily be adapted to use compressed air. It is ideal for applications such as lifting, positioning and installing air ducts, overhead sprinklers/plumbing, ceiling panels, forced air heaters/chillers, chimney pipes and electrical fixtures. The Super Tower lifts and supports lighting systems, sound systems and stage scenery to heights of up to 24' 4" (7.4 m). 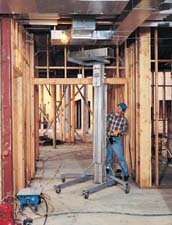 The Genie Lift lifts up to 500 lb (227 kg) to heights of up to 12' (3.7 m). 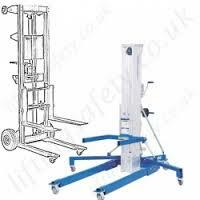 Available with three base options, various load handling attachments, optional tyres and ladders, the Genie Lift is ideal for appliactions such as transporting appliances, lifting heavy material to or from shelves, moving office equipment, installing ceiling/wall appliances, installation and servicing of overhead TV monitors, record storage and retrieval, HVAC installation and repair, lifting and moving automotive parts, shipping and receiving. The Genie Superlift Advantage is a manually operated material lift with multiple base, winch and load handling options. The SLA lifts up to 1000 lb (454 kg) of material to heights of up to 26' (7.9 m). 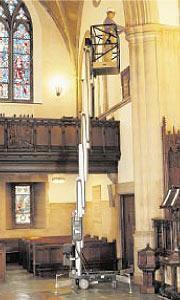 The Genie Superlift Contractor lifts up to 650 lb (295 Kg) to heights of up to 22' (6.8 m). Designed specifically for the construction industry and contractors, the SLC is extremely durable and easy to transport. From compact machines with low overall weight to heavy lifting requirements with ease and efficiency. Genie sets the standard by which other lifts are judged. Simply put, we build a better lift. Our innovative designs and reliable products have made Genie a world leader in the production of material lifts, portable aerial work platforms, scissor lifts, and self-propelled telescopic and articulated booms. 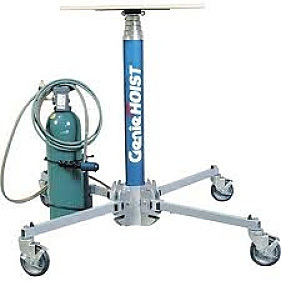 The company began in 1966 with the introduction of the Genie Hoist, a portable, pneumatic material lift. We quickly gained worldwide recognition with additional material lifts and a series of aerial work platforms, each one representing a breakthrough in product design. Thirty years later, Genie remains at the forefront of innovative design and quality production. Our lifts are the first choice on construction and industrial sites around the world. * We set high quality standards for each step of the manufacturing process, from design to distribution. We monitor our own performance against these standards to assure reliable products. * We continuously improve our lifting equipment to meet the needs of an ever-changing market. Our efforts to produce better products and harness new technology have earned numerous patents worldwide. * We deliver the most comprehensive technical support system in the industry. Our team members work together to keep Genie equipment on the job longer. * We provide our customers with superior value by selling products with ideal capabilities, for a variety of applications, at competitive prices. Genie products are built in seven specialized manufacturing plants comprising nearly one million square feet. We currently serve customers in 72 countries and continue to expand our global distribution network. Genie is a privately owned company headquartered in Redmond, Washington, USA, with branch offices in the United Kingdom and Western Europe. The New Genie Scissor GS(TM) Lifts are the best available. A competitively priced alternative to booms and portable aerial platforms, this line is built with the benefit of 30 years of experience and applied technology. The GS series is sturdy, offers narrow access capability, slide-out platform extension, quiet electric drives, rough terrain models, and working heights from 21 to 59 feet (6.4 to 18 m). * The Runabout features Genie's patented mast system with high strength, interlocking aluminum mast sections and heavy duty lifting chains. * Narrow 29&Mac184; in (75-cm) width and 53 in (1.35 m) length allows machine to fit in most passenger elevators. * Low 19 in (48-cm) entry height allows operators to enter the platform easily. Machine can be driven through doorways with operator on board. * Optional platform extension deck provides 20 in (51 cm) of horizontal outreach. * Standard non-marking tires and low unit weight allow use on sensitive flooring. * Standard dual wheel spring-applied, hydraulically released braking system. All models are driveable when fully elevated. GR-8 and GR-12 models can be driven when fully elevated with the optional platform extension deck deployed. GR-15 can be driven when fully elevated with the optional platform deck retracted. We have been involved in the sale of quality used access platforms for over eighteen years. Our impressive list of satisfied customers clearly shows that we do the job right. We will not just try to sell you a platform, we will work with you to ensure that you select the right machine for the task in hand, this includes site surveys and where necessary trial periods of suitability. Because our background is in engineering we understand the importance of thorough and professional preparation of all our used access platforms. We only use platform engineers, therefore all our pre delivery inspections are carried out impartially, and if replacement parts are needed we only use manufacturer's original equipment. We only use independent platform engineers, therefore all our pre delivery inspections are carried out impartially, and if replacement parts are needed we only use manufacturer's original equipment. Genie lifting and access equipment as well as a range of other lifting manufacturers equipment allow Powered Access Services to offer a fully comprehensive service to companies purchasing lifting equipment, access equipment a nd lift material handling equipment in the UK, Europe and Worldwide. Pwered Access Services are dealers for Genie Industries and supply many companies with both Access Products and Lift Material Handling Products from the Gen ie Range. PAS provide a large range of material handling and Lifting Equipm ent but if you don't see a particular product listed please call us as we are only to pleased to offer help and advice on a variety of issues. If you have any queries or comments regarding our products or our website please do not hesitate to contact us. 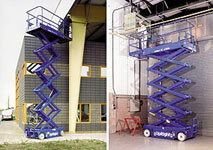 Genie lift and access equipment sets the standard by which other lifts are judged. The innovative designs and reliable products have made Genie Lift a world leader in the production of lift equipment, access equipment, materi al lift, portable aerial work platforms, scissor lift, and self-propelled Genie lift telescopic and articulated booms. 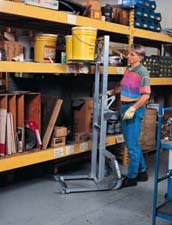 Genie lift products. Contact us now to discuss your Genie lift needs and find out about the full range of Genie lift equipment. Material lifting equipment and material lifts manufactured by Genie easily and safely lift up to 1000 pounds (454Kg.) from ground level to heights of up to 26 feet (7.9 m.). Each model is completely portable and highly manoeu vrable. Below are examples of the variuos models that are available. Load Lifter Super Hoist Genie Lift Superlift Advantage, Superlift Contractor, Super Tower. For further information of any of these material lifting equipment and mate rial lifts products us now on 01536 525136 or 01536 484733. Portable aerial work platforms manufactured by Genie. The "Super Series" ca n safely lift one or two people to working heights of up to 46 feet 3 ins. (14.1 m.). Easy to manoeuvre, Genie work platforms offer durability and the convenience of quick set up and operation. Below are some examples of the lifts that are available. Genie TZ-34/20 is an articulating Trailer Mounted boom with a telescopic pr imary boom. With a working height of 12.36m, the TX-34/20 features the industries leading working envelope and outreach (6.1m). The TZ-34/20 has a lif ting capacity of 200kgs. Hydraulic outriggers are standard and the exclusiv e automatic levelling system provides 11 degree levelling capability from t he ground controls. The system allows the machine to be set up in less that 40 seconds when the operator deploys all four outriggers simultaneously. Nothing beats a Genie Scissor for performance, safety, serviceability and v alue. The solid steel deck platform has a slip-resistant surface. Heavy duty tubular steel guardrails maximize durability. Telescopic end rai l can be raised to accommodate large loads. Lubrication-free, service-free pivot points. Built-in lanyard attachment points. The ergonomic Joystick Controller operates from the platform or the ground. Low noise level allows operation in quiet work environments. High angle steering provides excellent maneuverability. Swing-out battery box and power module allow easy access to componentry. Va riable speed motor extends battery and motor life by using only the energy needed to do the required work. On-board troubleshooting diagnostics notify the operators of possible fault conditions. GS-1532 has 21 ft (6.5 m) working height and GS-1932 has 25 ft (7.8 m) working height 39 in (1 m) roll-out platform extension Compact 32 in (81 cm) width 600 lb (272 kg) lift capacity for the GS-1532 and 500 lb (227 kg) lift capacity for the GS-1932 Compact design Automatic 25 amp battery charger Proportional controls for lift and drive functions Multiple disc brakes provide smooth deceleration Drive speed interlock limits speed while elevated Emergency stop at both platform and ground controls Manual platform lowering valve Manual brake release Pothole guards Non-marking tires AC wiring to platform Tilt level sensor with an audible alarm Beeper horn Hour meter Options and Accessories Motion alarm Air line to platform Platform swing gate Dual flashing beacon Maintenance-free battery Standards Compliance ANSI/SIA A92.6 CSA CAN3-B354.2-M82 CE compliance option AS 1418.10 GSTM- 4390RT / GSTM- 5390RT Large platform with durable diamond-plate aluminum flooring. A single 60 in (1.52 m) multi-position slide-out extension deck, on the front of the mach ine, comes standard. A second 48 in (1.22 m) slide-out extension deck, on the rear of the machine, is available as an option. Rear platform railing can be removed for easier loading and unloading of ma terials. Slide-out engine tray allows easy access to components. Automatic leveling hydraulic outriggers are standard on the GS-5390 RT, optional on the GS-4390 RT. Standard Features GS-4390 has 49 ft (14.9 m) working height and GS- 5390 RT has 59 ft (18 m) working height 1,500 lb (680 kg) load capacity Positive traction-controlled four-wheel drive 50% gradeability Proportional drive Two-speed lift functions Troubleshooting diagnostics Two self-closing entry gates Foam-filled tires AC wiring to platform Descent alarm Tilt sensor with an audible alarm Horn Hour meter Options and Accessories Motion alarm Dual flashing beacons Propane tank kit (single and/or additional) Dual slide-out extension deck package (front and rear) Hydraulic oil cooler 2,000 watt generator (110 volt/60 hz) Automatic leveling hydraulic outriggers (GS-4390 RT) Non-marking tires Standards Compliance ANSI/SIA A92.6 CSA CAN3-B354.2-M82 CE compliance option AS 1418.10 Genie Lift Telescopic STM Stick Booms set the industry standard for personn el lifts. With working heights from 46 to 131 feet (14 to 39.9 m); articula ted jibs on the Genie lift S45, S60, S85, S105 and S120 models, and options including two - and four-wheel drive, rough terrain packages and multi-pow er capabilities, the Genie Lift series S 45, S 60, S 85, S 105, S 120 will give you just the lift you need. Genie Lift Model S45 S 45 Genie Lift Model S60 S 60 Genie Lift S120 S 120 This is only a small section of the Genie Lift Telescopic Boom range, conta ct us now to further information regarding this range of products. Genie Lift Articulating "Z" Booms Z30 Z 30 Z45 Z 45 Z135 Z135 provide the ultimate in lifting versatility, with up, out and over positioning capabilit ies. Many Genie lift options are available, including two and four wheel dr ive, a rough terrain package, narrow access models that roll through standa rd double doorways; gas/lpg, diesel, electric, bi-fuel or tri-fuel capabili ties. Choose from the Genie Lift Z30 Z 30 Z45 Z 45 Z135 Z135 models with wo rking heights from 26 to 66 feet ( 7.9 to 20.1 m.); horizontal reach from 8 to 34 feet (2.4 to 10.4 m.). Genie Model Z 30 Z 30 Genie Model Z45 Z 45 Genie Model Z135 Z 135 TELEHANDLERS Rough Terrain Telescopic Boom Material Handler Genie Telehandlers are the perfect heavy-duty choice for loading, unloading , moving and placing loads or materials throughout any work site and cleani ng up when the project is complete. Our high reach rough terrain telehandle rs are the ultimate solution for maximizing work site productivity through efficient movement of material. All-around, cost-effective, reliable machin es with multiple attachments available for increased ROI on any job site. IPAF Training provided by PAS training to IPAF (International Powered Access Federation) standard. IPAF Training can either be carried out at your premises or we can arrange for it to take place at a training facility in the Midlands. London or Scotlands PASMA TRAINING We provide both Basic and Advanced, Alloy Tower Scaffold Training to PASMA Standard, either at a Training Centre in the Midlands, London or Scotland o r at your own promises. IPAF Safety Harness Training We provide Training for Safe Use, Fitting of and Inspection of, Safety Harnesses at a Training Centre in the London, Midlands or Scotland Depot or at your premises. Courses can be carried out in conjunction with any IPAF Training Course. Used Genie lifting and access equipment. We have a constant stock of used Genie Equipment for sale and we also sell off demonstration kit before it is 12 months old. If there is a used Genie model you are looking for that is not listed call our office on 01530 525136 Demonstration machine prices available on request. Spare parts for Genie JLG Manitou Upright SkyJack Nifty Haulotte. We are able to supply a full range of spare parts for the following makes o f equipment. PAS pride ourselves on the ability to provide an on site demonstration of a ll our products. This demonstration enables you as a customer to see the be nefits of a particular product on site prior to purchasing. Genie lifting and access equipment as well as a range of other lifting m anufacturers equipment allow Powered Access Services to offer a fully compr ehensive service to companies purchasing lifting equipment, access equipmen t and lift material handling equipment in the UK, Europe and Worldwide. Pwe red Access Services are dealers for Genie Industries and supply many compan ies with both Access Products and Lift Material Handling Products from the Genie Range. PAS provide a large range of material handling and Lifting Equ ipment but if you don=E2=80=99t see a particular product listed please call us as we are only to pleased to offer help and advice on a variety of issu es.If you have any queries or comments regarding our products or our websit e please do not hesitate to contact us. 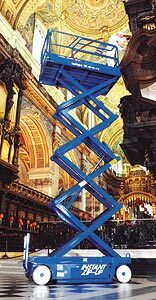 Genie lift and access equipment sets the standard by which other lifts a re judged. The innovative designs and reliable products have made Genie Lif t a world leader in the production of lift equipment, access equipment, mat erial lift, portable aerial work platforms, scissor lift, and self-propelle d Genie lift telescopic and articulated booms. Genie lift products. Co ntact us now to discuss your Genie lift needs and find out about the full r ange of Genie lift equipment. 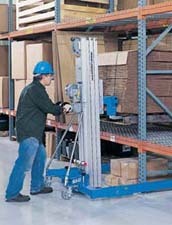 Material lifting equipment and material lifts manufact ured by Genie easily and safely lift up to 1000 pounds (454Kg.) from ground level to heights of up to 26 feet (7.9 m.). Each model is completely porta ble and highly manoeuvrable. Below are examples of the variuos models that are available. Portable aerial work platforms manufactured by Genie. 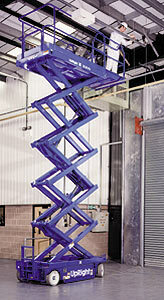 The "Super Series" can safely lift one or two people to working heights of up to 46 feet 3 ins. (14.1 m.). Easy to manoeuvre, Genie work platforms off er durability and the convenience of quick set up and operation. Below are some examples of the lifts that are available. Genie TZ-34/20 is an articulating Trailer Mounted boo m with a telescopic primary boom. With a working height of 12.36m, the TX-3 4/20 features the industries leading working envelope and outreach (6.1m). The TZ-34/20 has a lifting capacity of 200kgs. Hydraulic outriggers are sta ndard and the exclusive automatic levelling system provides 11 degree level ling capability from the ground controls. The system allows the machine to be set up in less that 40 seconds when the operator deploys all four outrig gers simultaneously. The exclusive Genie Automatic Leveling System is =E2 =80=9Cself-leveling=E2=80=9D and is standard equipment on all TZ-50 models. This system provides industry-leading 10 degrees leveling capability and a llows the operator to hydraulically deploy the outriggers and automatically level the machine. Machine setup can be completed in less than 45 seconds when the operator deploys all four outriggers simultaneously. The sy stem self-levels the machine to 1 degree in all directions. The level senso r alarm will not sound unless the machine is over 21/2 degrees out of level . This built-in tolerance provides resistance to level sensor =E2=80=9Cnuis ance tripping=EF=BF=BD=EF=BF=BD, which can be a common occurrence on other trailer mounted booms. This feature increases productivity and sets the Gen ie TZ-50 apart from the competition. Scissor Lifts by Genie are the best available. A compe titively priced alterative to aerial work platforms and booms, this scissor lift line is built with the benefits of 30 years experience and applied te chnology. The GS scissor lift series is sturdy, offers narrow access capabi lity, slide out platform extension, quiet electric drives, rough terrian mo dels and working heights from 21 to 32 feet 9 in. (6.4 to 9.8 m.). The ergonomic Joystick Controller operates from the platform or the gro und. Swing-out battery box and power module allow easy access to componentry . Variable speed motor extends battery and motor life by using only the ene rgy needed to do the required work. On-board troubleshooting diagnostics no tify the operators of possible fault conditions. Large platform with durable diamond-plate aluminum flooring. A single 6 0 in (1.52 m) multi-position slide-out extension deck, on the front of the machine, comes standard. A second 48 in (1.22 m) slide-out extension deck, on the rear of the machine, is available as an option. Rear platform railing can be removed for easier loading and unloading o f materials. Automatic leveling hydraulic outriggers are standard on the GS-5390 RT, optional on the GS-4390 RT. 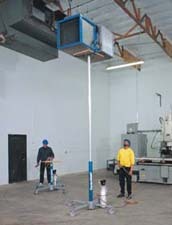 Genie Lift Telescopic STM St ick Booms set the industry standard for personnel lifts. With work ing heights from 46 to 131 feet (14 to 39.9 m); articulated jibs on the Genie lift S45, S60, S85, S105 and S120 models, and options including two - an d four-wheel drive, rough terrain packages and multi-power capabilities, th e Genie Lift series S 45, S 60, S 85, S 105, S 120 will give you just the l ift you need. This is only a small section of the Genie Lift Telescopic Boom range, co ntact us now to further information regarding this range of products. Genie Lift Articulating "Z" Booms Z30 Z 30 Z45 Z 45 Z1 35 Z135 provide the ultimate in lifting versatility, with up, out and over positioning capabilities. Many Genie lift options are available, including two and four wheel drive, a rough terrain package, narrow access models tha t roll through standard double doorways; gas/lpg, diesel, electric, bi-fuel or tri-fuel capabilities. Choose from the Genie Lift Z30 Z 30 Z45 Z 45 Z13 5 Z135 models with working heights from 26 to 66 feet ( 7.9 to 20.1 m.); ho rizontal reach from 8 to 34 feet (2.4 to 10.4 m.). Genie Telehandlers are the perfect heavy-duty choice for loading, unloading, moving and placing loads or materials throughout any work site and cleaning up when the project is complete. Our high reach rough terrain telehandlers are the ultimate solution for maximizing work site productivity throu gh efficient movement of material. All-around, cost-effective, reliable machines with multiple attachments available for increased ROI on any job site . IPAF Training provided by PAS training to IPAF (International Powered Access Federation) standard. Standard, either at a Training Centre in the Midlands, London or Scotland or at your own promises. carried out in conjunction with any IPAF Training Course. 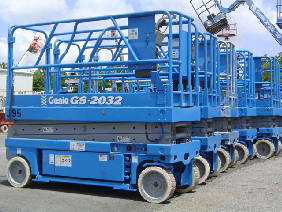 Used Genie lifting and access equipment. Demonstration machine prices available on request. Spare parts for Genie JLG Manitou Upright SkyJack Nifty Haulotte. PAS pride ourselves on the ability to provide an on site demonstration of all our products. This demonstration enables you as a customer to see the benefits of a particular product on site prior to purchasing. This compact scissor lift is highly manouevrable and is perfect in tight spaces and will fit through standard doorways. It features a 900mm roll out deck extension, solid rubber non-marking tyres, pot hole protection and dual parking brakes. The Skyjack SJ3219 is a versatile, manoeuvrable and reliable scissor lift platform capable of working at heights of up to 7.6m. This conventional scissor lift offers rugged, reliable performance for all on- slab applications. This scissor lift is only 0.76m wide, slim enough to fit through standard doorways and down narrow aisles. Front wheel drive and front wheel steering give superior manouvrability in tight places. Proportional drive and lift controls make one man operation simple. CE rated for indoor/outdoor use. 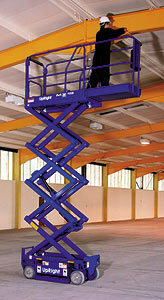 A larger scissor lift with more capacity and more working room and 26ft platform height. A larger scissor lift with more capacity and more working room and 32ft platform height. 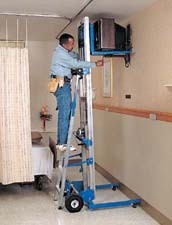 The Upright TM12 provides a safe, efficient means of working at height in restricted spaces typically encountered in offices, retail stores, hotels, public buildings or crowded industrial aisles. Its compact size also makes it ideal for applications such as stock picking and record storage retrieval. Operators simply step onto the platform, drive to the work location and elevate to the desired height. When the job is complete, the lift can be quickly lowered and returned to a convenient storage area. 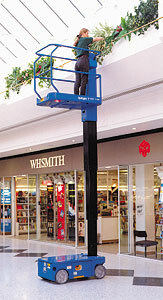 A highly manoeuvrable scissor lift with an extending platform and approximately 25ft working height. Proven with users world wide, the SL20 has earned itself a reputation for reliability and performance second to none. Improved design provides a low stowed height and greater manoeuvrability. This narrow aisle machine incorporates many features including one-hand proportional joystick control, roll out deck extension, non marking tyres and hydraulic pothole protection. The X series from Upright are formidable machines,designed to provide an efficient solution for all your property maintenance and installation tasks with an unrivalled performance unmatched at the price. The secret of the X series astonishing versatility lies in its impressive specification. Compact dimensions and a tight turning radius make manoeuvring easy in restricted locations whilst the roll out deck extension provides a large working platform area and over-reach facility. With working heights up to 11.8 metres and modern scissor design for extra rigidity it's easy to see why the X series is one of the world's best selling platforms. The X series from Upright are formidable machines, designed to provide an efficient solution for all your property maintenance and installation tasks with an unrivalled performance unmatched at the price. The MB20N and MB26 Mast Boom Lifts have been equiped to give maximum productivity in minimum space. With working heights between 26ft and 32ft and nearly 10ft of outreach, the MB Mast Booms really are versatile performers. The articulating jib coupled with 360 degree rotation gives access to hard to reach areas plus the compact dimensions and tight turning radius make manoeuvring easy in any work place. Ideal areas for the versatile Mast Boom are manufacturing plants, supermarkets, shopping centres, hotels, hospitals and warehouses. Sturdy push-around lift that doesn't need stabilsers, making it ideal for those tight access situations. Easy to use one man operation and easy to load and transport. Small enough to go through standard doorways. On board charger for the battery operated anodised mast and non-marking tyres. Sturdy push-around lift fitted with stabilisers for extra stability. Easy to use one man operation and easy to load and transport. Small enough to go through standard doorways. Sturdy push-around lift fitted with stabilisers for extra stability. Easy to use one man operation and easy to load and transport. Sturdy push-around lift fitted with stabilisers for extra stability. Easy to use one man operation and easy to load and transport. A tilt-back mechanism allows the machine to go through standard doorways. JLG Products available from Powered Access / RAC Kettering. JLG Products available from Northern Access.